The pressures of modern day life combined with unfavourable factors such as sunlight, make-up and hard water can cause a lot of stress and imbalance to your skin. It is more important than ever that you take care of yourself and take measures that benefit your skin. In the industry there are a million+ cosmetic solutions for taking care of your skin, and all of them having there own ingredients and working methods. One of these products standing closest to nature is Argan Oil. This oil is an ancient product discovered hundreds of years ago in the Northern African desert. 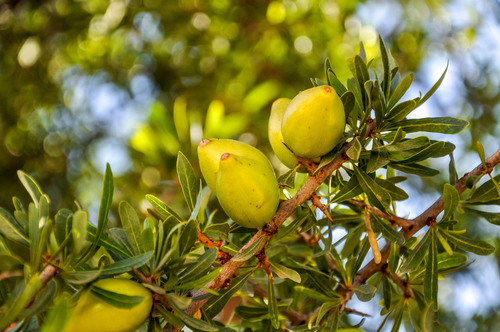 Argan oil is made out of the Argania tree, which only grows in the Moroccan semi-desert. Because of its exclusivity it is a relatively rare product. Together with its character, people therefore also refer to it as ‘Moroccan Gold’. Extraction is done by drying the fruits, after which the oil is pressed out of the argan nuts. Most of this process is done by hand, since complete mechanical production has not yet been proven to be successful. Argan oil is becoming increasingly popular among cosmetic products. Its use is proven to be good for strengthening your skin and immune system. It is also recommended in the prevention of wrinkles, hair loss and acne. La Decollete® is more than proud that this beautiful product is part of our collection especially for the delicate part of the skin of the cleavage.